routes. 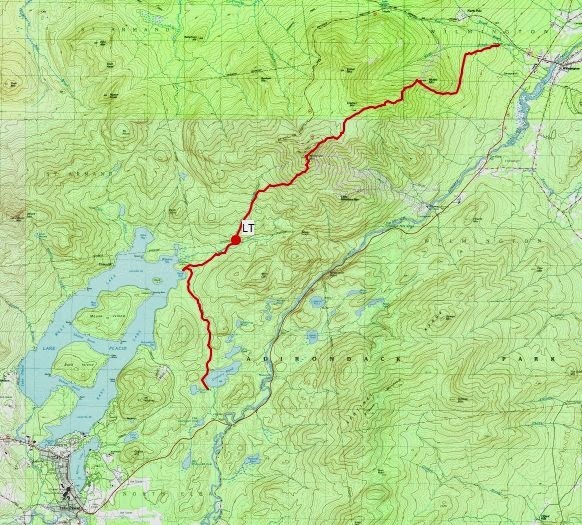 In the case of Whiteface Mountain, I had not climbed it from Connery Pond or from the Wilmington Reservoir, so when I heard ADKJack (from the ADK High Peaks Forum) was headed that way on Friday I volunteered to tag along. I had XC skied from Connery Pond to the Whiteface Leanto, but had never climbed to the summit from that route. We met at the Connery Pond parking lot at 9:30 and were on the trail at 9:45. My dog Rev joined us. My wife Leesa was kind enough to volunteer to park our car at the Wilmington Reservoir to pick us up at the end of our traverse. She actually met us on top of Marble Mountain. The jeep trail to Whiteface Landing was drier than I had expected it to be. It was a fast 45 minute walk. From Whiteface Landing we began the climb of Whiteface and 30 minutes later we arrived at the Whiteface leanto. The leanto is about 3.5 miles from Connery Pond, but we had only climbed 400' thus far and still had 2700' to climb. I had some trail mix and we continued on. As we climbed, it was obvious that we climbing into the clouds. Our visibility was deteriorating. As we got high on the shoulder we were in the fog of a cloud and had no visibility. No views of Lake Placid were to be had today. As we started to climb out of the trees, the terrain felt very similar to the White Mountains. The fog felt similar too! This part of the trail (high shoulder) was really interesting. I'm now batting 50 percent on visits to Whiteface. I've had 2 visits with fantastic visibility and 2 visits socked in the clouds. It had taken us 3.5 hours to hike the 6 miles to the summit from Connery Pond. One thing about the clouds and fog, it kept visitors away. There were only a dozen or so people milling about on the summit. If it had been a bluebird day, I'm sure lots of people would have driven up. We left the summit and hiked the trail down to the Wilmington turn. From this point to the cairn marking the intersection with the Esther herd path, the trail was very wet. Lots of standing water and mud. Jack had entertained the thought of going to Esther but he didn't want us to hold up Leesa who would be at the Wilmington Reservoir trailhead. We skipped Esther and continued on towards Marble Mountain. I called Leesa on our 2 way radios, and it turned out she was on the trail and nearing the summit of Marble Mountain. We all met on the summit of Marble. The trip down to Wilmington Reservoir was a new trail for me. I found this trail to be very nice. Much nicer than the trail from the ASRC (in my opinion). It doesn't get a lot of use and therefore has minimal mud. The trail from Whiteface leanto to the summit is also lightly used and is in great condition. Thanks Jack for letting me tag along with you on this hike. It was a pleasure to hike with you once again. This traverse was a nice way to see Whiteface.